+ Now is the time of the last Pope according to the prophecy of St. Malachy. + Rome must be conquered but by whom? Et sera Rome lesse par Albanois(3). And Rome will be injured by Albanians(3). A cardinal's hat: a red hat. In ancient times the sign was worn by freed slaves. They also used the free citizens in the feasts and solemnities). Currently it is deprecated and no longer imposes pope to cardinals. A cardinal's ring, which is different from ordinary bishops. When in choir dress, a Latin-rite cardinal wears scarlet garments — the blood-like red symbolizes a cardinal's willingness to die for his faith. Excluding the rochet — which is always white — the scarlet garments include the cassock, mozzetta, and biretta (over the usual scarlet zucchetto). The biretta of a cardinal is distinctive not merely for its scarlet color, but also for the fact that it does not have a pompon or tassel on the top as do the birettas of other prelates. Until the 1460s, it was customary for cardinals to wear a violet or blue cape unless granted the privilege of wearing red when acting on papal business. His normal-wear simar is black but has scarlet piping and a scarlet fascia (sash-like belt). Occasionally, a cardinal wears a scarlet ferraiolo which is a cape worn over the shoulders, tied at the neck in a bow by narrow strips of cloth in the front, without any 'trim' or piping on it. It is because of the scarlet color of cardinals' vesture that the bird of the same name has become known as such. 2+ SABINE: The Sabines were an Italic tribe that lived in the central Appennines of ancient Italy, also inhabiting Latium north of the Anio before the founding of Rome. Plutarch also states in the Life of Numa Pompilius, "Sabines, who declare themselves to be a colony of the Lacedaemonians..." According to the account, the Sabine habits of belligerence (aggressive or warlike behavior) and frugality (prudence in avoiding waste) were known to have derived from the Spartans. Thus a Sabine is not a Roman, is a foreigner...... like Ratzinger (Benedict XVI) a native of Bavaria, he has both German and Vatican citizenship. 3+ ALBANIANS are defined as an ethnic group native to Albania and neighboring countries or as citizens of the Republic of Albania regardless of ethnicity. Ethnic Albanians speak the Albanian language and more than half of ethnic Albanians live in Albania and Kosovo. The Albanian diaspora also exists in a number of other countries. Duke of Alba (Spanish: Duques de Alba de Tormes) is a Spanish title of nobility accompanied with the dignity Grandee of Spain. In 1472 the title Count of Alba de Tormes, inherited by García Álvarez de Toledo, was elevated to the title Duke of Alba by King Henry IV of Castile. 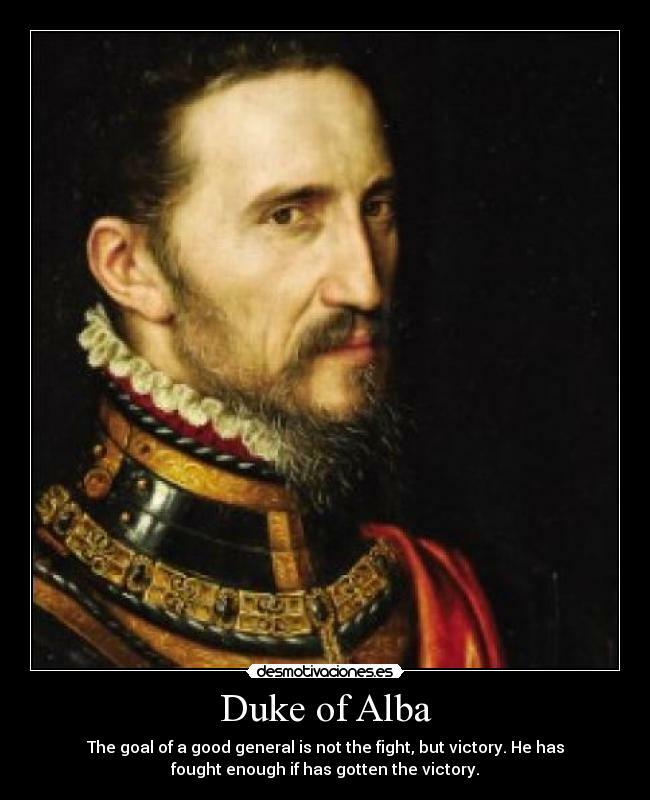 Duke of Alba de Tormes is one of the main titles of Spain and historically, one of the most powerful families in Europe; which gives its name to the House of Alba. He was the most trusted and obedient servitor of the Spanish king Carlos I and his successor Philip II, both chief steward and member of their Council of State and War. He was charged with the government of the Duchy of Milan (1555–1556), the Kingdom of Naples (1556–1558), the Netherlands (1567–1573) and the Kingdom of Portugal (1580–1582). He represented Philip II at his betrothal to Elizabeth of Valois, daughter of Henry II of France and Anne of Austria, daughter of the Holy Roman Emperor, Maximilian II. Considered by historians as the greatest general of his time and one of the best in history, Alba especially distinguished himself in La Jornada de Túnez, and in many campaigns during the Religious Wars and the Spanish annexation of Portugal, including the Mühlberg, Jemmingen and Alcántara. He is most remembered in Western European history for his sometimes brutal attempts to pacify, and eradicate sedition in, the Netherlands, where he acted with great rigor in punishing the Dutch rebels. Among other efforts, he instituted the Council of Troubles and repeatedly defeated the troops of William of Orange and Louis of Nassau in the early stages of the Eighty Years War. He capped his career in his latter years with the succession crisis in Portugal in 1580, conquering that kingdom for Philip II. As a result of his military genius, Spain achieved the unification of the entire Iberian Peninsula and the consequent expansion of the overseas territories. + On January 25, 2012, the first leaked documents discovered dirt in the supply contracts of the Vatican State. The leak rate increases into a waterfall. "Vatileaks' is continuous and devastating. 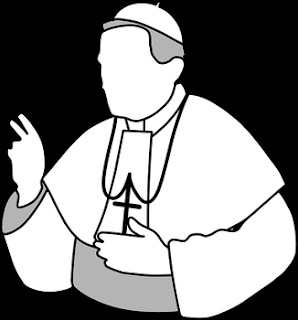 + THE VATILEAKS scandal is a scandal initially involving leaked Vatican documents, allegedly exposing corruption; an internal Vatican investigation purportedly uncovered the blackmailing of homosexual clergy as well. The scandal first came to light in late January 2012 in a television programme aired in Italy under the name of The Untouchables (Gli intoccabili). Further information was released when Italian journalist Gianluigi Nuzzi published letters from Carlo Maria Viganò, formerly the second ranked Vatican administrator to the pope, in which he begged not to be transferred for having exposed alleged corruption that cost the Holy See millions in higher contract prices. Viganò is now the Apostolic Nuncio to the United States. The name "VatiLeaks" is a play on the word WikiLeaks, an organization that has facilitated the public disclosure of thousands of confidential documents. + The working environment in the Curia becomes a hell everyone suspects everyone. Butler's arrest in May just relieved, because the slowness of prosecutors and judges delayed Vatican clarifying the facts until after the summer. + In this bleak atmosphere, the Vatican worsened his image throwing short shrift to the president of your own bank. Again and again are Italian intrigues, and many bishops of the world concluded that the Vatican could not be ruled "the Italian." The appointment of 22 new cardinals in February had drawn complaints privately to the Pope, as the overwhelming majority were Italians, curial officials and people close to Secretary of State, Tarcisio Bertone. + In the October Synod of Bishops became more than a match for the new evangelization. In corridors and gatherings addressed the problem of lawlessness, and uncovered valuable characters between the synod fathers younger and away from Europe. + In this situation, Benedict XVI made ​​a strategic decision: he named six new cardinals (non-European) to "complete the appointments of February with a gesture of universality of the Church." + Since the pontificate of Pius XI (1922-1939), there were never two "batches" of cardinals in the same year, but Benedict XVI considered urgent change of course. The Italians are about 5 percent of the world's Catholics, but account for 25 percent of the cardinal electors. The "italianizatión" of the Roman Curia in the shade of Cardinal Bertone should make way for internationalization. + But according to a statement from the Vatican, the timing of the resignation was not caused by any specific illness but was to "avoid that exhausting rush of Easter engagements". + Does the Pope Benedict XVI in whom could really to trust? + I think that Albanians are Muslim soldiers of an army much more powerful. Feu, sang, morbilles point d'eau faillir les bleds. The Albanians(3) will pass into Rome. Fire, blood, morbid watering the crops to fail. 4+ LANGRES is a commune in north-eastern France. It is a subprefecture of the Haute-Marne département in the Champagne-Ardenne region. The town prospered in the Middle Ages due, in part, to the growing political influence of its bishops. The diocese covered Champagne, the Duchy of Burgundy and Franche-Comté, and the bishops gained the right to coin money in the 9th century and to name the military governor of the city in 927. The Renaissance, which returned prosperity to the town, saw the construction of numerous fine civil, religious and military buildings that still stand today. Nostradamus may refer to someone associated with this city. + It is obvious: decline and corruption. Massacre. + Now I hope Benedicto XVI to go to Lourdes.,.. and from there he will be carried to three leagues from Lyon, where he will be killed as explained by the third prophecy of Fatima. It was Pope Benedict XVI who has personally decided to still be called "His Holiness Benedict XVI", or "Papa Emeritus Roman Pontiff." (He will continue wearing a white dress). + Collapse of the World Economy. + and MABUS must die and no one can prevent it. + The Jewish synagogue sterile (Israel) be defeated by Mesopotamia (now Iraq). + .....unfortunate Greece, Italy, Rome, Pope, Spain & Marseilles. Et cetera. "Tunis, Algiers revolted by Persians:"
"So that blues and perses the cross will pursue to death." "Resurrect the great King of Algoumois"
4+ From Europe to Tunis. "Barbarian driven away back as far as Tunis." Century I - Quatrain 73, possible English traslation. Leon, Seville , Barcelona fallen. Will not have the fleet by the Venetians. +Looks like Nostadamus relates a possible attack to France with revolutions in Algeria and Tunisia. + To get to France we must travel by land or sea. Spanish cities mentioned in quatrain must be conquered by the enemy. Flags of Argelia & Tunisia. "States of the crescent moon"
Que bleux (2), pers, croix, a mort dechassera. From Fes (1) the realm will reach those of Europe. So that blues(2) and perses the cross will pursue to death. _The city of Fez is the capital of Islam in Morocco, in the region of Fez-Bulman and Fez prefecture, is the second largest city of Morocco, with a population of approximately 1 million (2010). _It is one of the called four imperial cities with Marrakech, Meknes and Rabat. In Morocco is considered the religious and cultural center of the country. Its university, famous for the study of Arabic and Islam, make way point of a large number of Moroccan students. + "Known as the Blue People for the indigo pigment in the cloth of their traditional robes and turbans that stains their skin, the MNLA Tuaregs consider this region (of Mali), which they call AZAWAD, to be the cradle of their nomadic civilisation." _Tuareg, French Touareg , Tuareg are Berber-speaking pastoralists who inhabit an area in North and West Africa ranging from Touat, Alg., and Ghudāmis, Libya, to northern Nigeria and from Fezzan, Libya, to Timbuktu, Mali. Their political organizations extend across national boundaries. 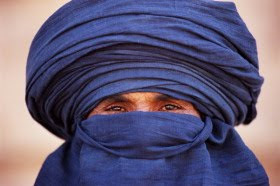 +In Tuareg society women do not traditionally wear the veil, whereas men do.The most famous Tuareg symbol is the Tagelmust (also called éghéwed), referred to as a Cheche (pronounced "Shesh"), an often indigo blue-colored veil called Alasho. The men's facial covering originates from the belief that such action wards off evil spirits. It may have related instrumentally from the need for protection from the harsh desert sands as well. It is a firmly established tradition, as is the wearing of amulets containing sacred objects and, recently, also verses from the Qur'an. Extremist rebels have taken control of much of northern Mali since March and have allied themselves with the Tuareg people of the region.The insurrection began in January 2012. 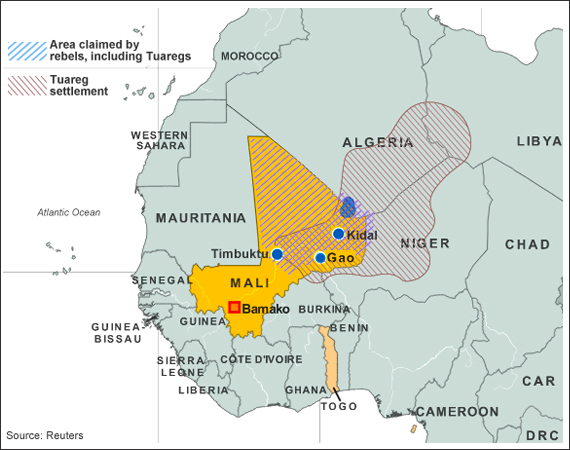 By April 1, the rebels had successfully taken the region's three main cities: Kidal, Gao and Timbuktu. + The great alliance against Europe: Asia and North Africa .... and also Mali. 1+ "ANGOLMOIS" is "ANGOUMOIS": This territory was conquered or reconquered by the best king of France, Charles V the Wise, who reigned in France in one of its most difficult historical moment. These will not be a vacation maritime. TUNISIA Retreat to Tunis. Defeat. Barbare pulse bien loing jusqu'a Thunis. Barbarian driven away back as far as Tunis. +In the territory of the current Tunisian the city of Carthage flourished, founded in the eighth century. BC. by Phoenicians from Tyre. By the sixth century BC, Carthage had subjugated the Libyan tribes and annexed the ancient Phoenician colonies, thereby controlling the entire coast of North Africa, from the Atlantic to the western border of Egypt and Sardinia, Malta, the Balearic islands and part of Sicily. +Carthage was almost continuously at war with Greece and Rome for 150 years. 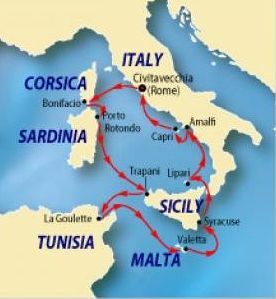 The wars with the Greeks, which began in 409 BC, took place for control of Sicily, located about 160 km north of Carthage, which formed a natural bridge between North Africa and the Italian mainland. 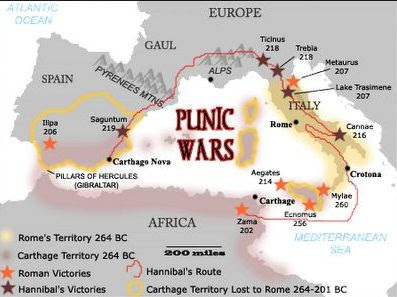 It was finally conquered by the Roman Empire to be defeated in the Punic Wars in the second century. BC. Military path of Anibal and his troops to Rome and back home. And his best general was Hannibal who vowed to destroy Rome and almost succeeded. I guess this history is repeating in the minds of Nostradamus. 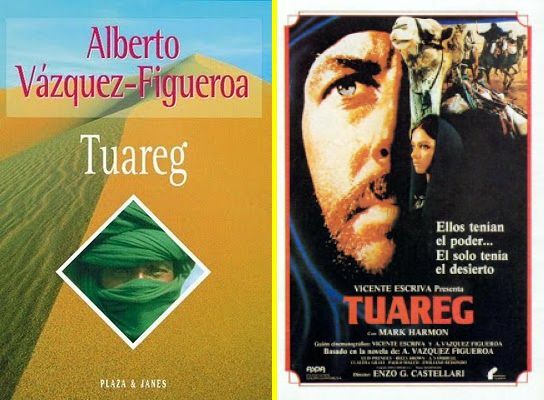 "Tuareg", written in 1981, is the best novel by Alberto Vazquez Figueroa, something recognized by critics and by the same author. + Pour le Quai d'Orsay, l'Afrique est une zone "rouge"
Benedict XVI to go to Lourdes.,.. and from there he will be carried to three leagues from Lyon, where he will be killed. One will be expelled from Rome and he will return. In a sudden announcement that caught Catholics around the world off guard, Pope Benedict XVI said he will resign at the end of February, becoming the first pontiff to step down in nearly 600 years. The Prophecy of the Popes, attributed to Saint Malachy, is a list of 112 short phrases in Latin. They purport to describe each of the Roman Catholic popes (along with a few anti-popes), beginning with Pope Celestine II (elected in 1143) and concluding with current pope Benedict XVI's successor, a pope described in the prophecy as "Peter the Roman", whose pontificate will end in the destruction of the city of Rome. "Taking Nostradamus’ final line in mind, the next pope, in the name of peace reaches out to radical Islam. Unfortunately, the enemy turns on him, and the great plague foreseen comes out of biological or chemical weapons of mass destruction used by terrorists. A number of Nostradamus’ prophecies infer such attacks on Rome will take place, forcing the evacuation of a future pontiff." "In the midst of this endless sea, two solid columns, a short distance apart, soar high into the sky. One is surmounted by a statue of the Immaculate Virgin, at whose feet a large inscriptions reads:" 'Auxilium Christianorum' ('Help of Christians') . The other, far loftier and sturdier, supports a Host of proportionate size, and bears beneath it the inscription: 'Salus credentium' ('Salvation of believers'). "The flagship commander - the Roman Pontiff- standing at the helm, strains every muscle to steer his ship between the two columns, from whose summits hang many anchors and strong hooks linked to chains. The entire enemy fleet closes in to intercept and sink the flagship at all costs. They bombard it with everything they have: books and pamphlets, incendiary bombs, firearms, cannons. The battle rages ever more furious. Beaked prows ram the flagship again and again, but to no avail, as, unscathed and undaunted, it keeps on it course. At times, a formidable ram splinters a gaping hole in its hull, but immediately, a breeze from the two columns instantly seals the gash. "Meanwhile, enemy cannons blow up; firearms and beaks fall to pieces; ships crack up and sink to the bottom. In blind fury, the enemy takes to hand-to-hand combat, cursing and blaspheming. Suddenly the Pope falls, seriously wounded. He is instantly helped up, but struck a second time, dies. A shout of victory rises from the enemy, and wild rejoicing seeps their ships. But no sooner is the Pope dead than another takes his place. The captains of the auxiliary ships elected him so quickly that the news of the Pope's death coincides with that of his successor's election. The enemy's self-assurance wanes. "Some auxiliary ships, which had gallantly fought alongside their flagship, are the first to tie up at the two columns. Many others, which had fearfully kept far away from the fight, stand still, cautiously waiting until the wrecked enemy ships vanish under the waves. Then they too head for the two columns, tie up at the swinging hooks and ride safe and tranquil beside their flagship. A great calm now covers the sea. " (memoirs, Vol. VII. Pages 107-108). The wave Fiesole Olympic ascend. "It was a dark night , and men could no longer find their way back to their own countries. Suddenly a most brilliant light shone in the sky, illuminating their way as at high noon. At that moment from the Vatican came forth, as in procession, a multitude of men and women, young children, monks, nuns, and priests, and at their head was the Pope. One side of the banner bore the inscription: Regina sine labe concepta [Queen conceived without sine],and the other side read: Auxilium Christianorum [Help of Christians]. But the two angels went on: "Go now, comfort your children. Write to your brothers scattered throughout the world that men must reform their lives. This cannot be achieved unless the bread of the Divine Word is broken among the peoples. Teach children their catechism and preach detachment from earthly things. The time has come," the two angles concluded, "when the poor will evangelize the world. Priests shall be sought among those who wield the hoe, the spade, and the hammer, as David prophesied: 'God lifted the poor man from the fields to place him on the throne of His people.'" On hearing this, the Pontiff moved on, and the ranks began to swell. Upon reaching the Holy City, the Pontiff wept at the sight of its desolate citizens, for many of them were no longer. He then entered St. Peter's and intoned the Te Deum, to which a chorus of angels responded, singing: Gloria in excelsis Deo et in terra pax hominibus bonae voluntatis [Glory to God in the highest, and peace on earth to men of good will.] When the song was over, all darkness vanished and a blazing sun shone. The population had declined greatly in the cities and in the countryside; the land was mangled as if by a hurricane and hailstorm, and people sought each other, deeply moved, and saying: Est Deus in Israel [There is a God in Israel]. From the start of the exile until the intoning of the Te Deum, the sun rose 200 times. All the events described covered a period of 400 days." And ROME, what will happen to the city of ROME? +The Pope resigns, but ..... Does God will renounce to him? 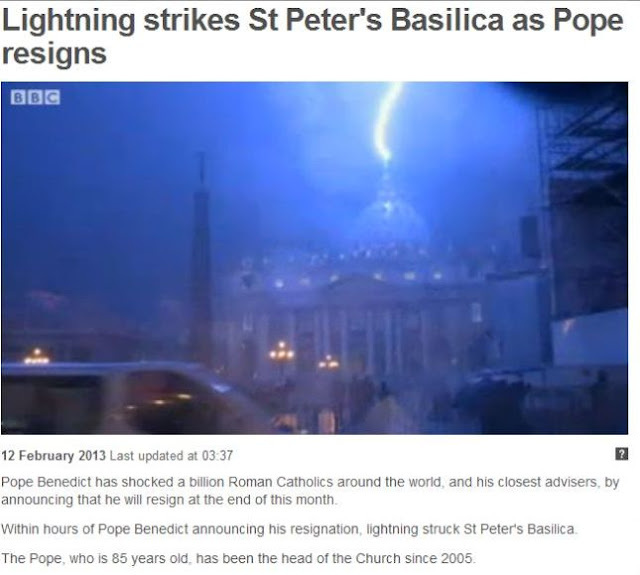 + What is going to happen to the two popes? +I think now will be easier to assassinate Pope Benedict XVI near to Lyon. +He not will have bodyguards because he will be only a religious man. +So the prophecies will be fulfilled. ..... Also the third prophecy of Fatima. + Now I hope Benedicto XVI to go to Lourdes.,.. and from there he will be carried to three leagues from Lyon, where he will be killed.